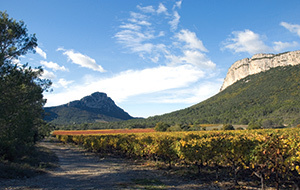 At 658 metres altitude and 30 kilometres from the Mediterranean sea, on the fi rst spurs of the Cevennes and Massif Central hills, the Pic Saint Loup is bursting with perfumes, pure essences of the most northern of the Languedoc appellations; holm oaks, garrigue scrubland, pines, thyme, laurel, rosemary. The fruits spring to life from the heart of varied soils, chalky-clay on marly sub-soils, and forge their character over contrasting seasons. In winter, the earth receives enough water to balance out the moderately dry summer and the swings in temperature between day and night. 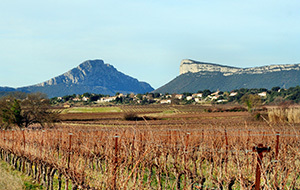 The exacting and contrasting Pic Saint Loup land and its soil types and climate, are all refl ected in the traits of our wines. My property, La Bergerie du Capucin, extends over more than 15 hectares, on Pic Saint Loup land, in the communes of Lauret and Valfl aunès. Only a few kilometres away from our home, winery and cellars, La Bergerie du Capucin stands proud: it is an everyday reminder of Jeanne, my son’s ancestor, whom I wish to honour. Because wine is also a family affair, its beauty and its bouquet of aromas refl ecting the values transmitted from generation to generation. Jeanne, an elegant, beautiful, very vivacious lady - shepherdess on the high plains of the Bergerie du Capucin - inspired my fi rst wine, reminding us of the delicate, round characteristics of our family wines and the hill paths she trod each day. Area under production (Hectares): 15 ha. Average volume produced (Hectolitres): 600 hl in the three colours. Average number of bottles sold: 80,000 bottles. Distribution: wine specialists, on-trade, domain’s cellars, export. 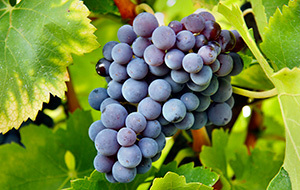 Grape varieties: chardonnay, grenache, mourvèdre, syrah, viognier.